"This recipe tastes like it took a lot of effort to prepare when, in fact, it is very, very easy." In a large skillet combine the pineapple juice, brown sugar, ketchup, ginger, garlic salt, cornstarch and soy sauce. Simmer all together for 5 minutes over low heat. 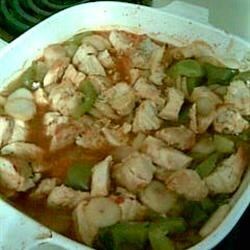 Place cooked chicken, bell pepper, onion, and water chestnuts in a 9x13 inch baking dish. Pour skillet mixture/sauce over the top. Cover dish with aluminum foil and bake in the preheated oven for 1 hour. I just served this recipe to 150 people last night and they thought it was exceptional!!!! A big hit all around! delicious and sooo easy! I also added pineapple chunks, broccoli, carrots, red peppers and snow peas. I love veggies! The sauce was mild and sweet...great for kids.